Discussion in 'UFOs, Aliens, Monsters, and the Paranormal' started by Mick West, Jun 23, 2013. Manchester Museum is getting a lot of publicity for a video of a statue that slowly rotates through the course of the day. It's on a glass shelf, and it only moves when there are people walking nearby. This raises the obvious suggestion that the rotation is simply due to the vibration. The statue is hard uneven stone, and the glass shelf is very hard and perfectly flat. When two hard substances are in contact with each other, then there's not much friction because there are limited points of contact. I suspect that the base of the statue is uneven, which allows it to tilt and pivot very slightly from the vertical vibration from people walking by. The shelf is very slightly tilted towards the front, so the statue rotates until the center of gravity is at the lowest point, and then it stops. 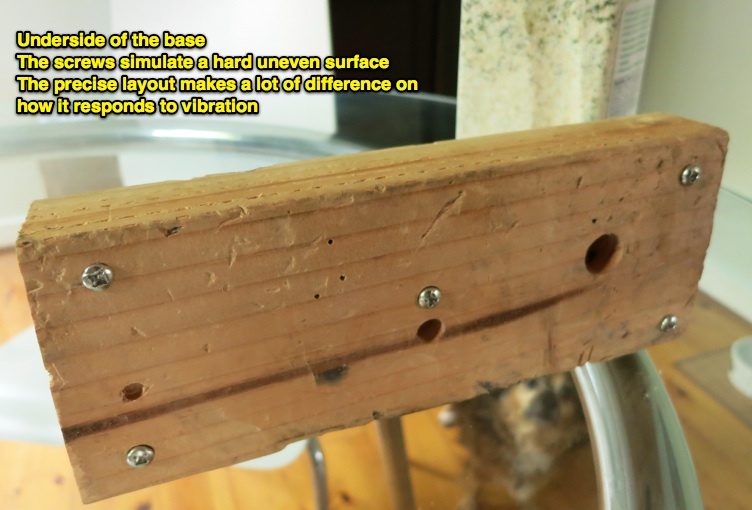 supported wooden floors, and such vibration is extremely expensive to reduce. much higher and more damaging vibration levels than public circulation. Vibration can lead to object damage through a number of mechanisms. catastrophic both to the object itself and to objects below. 0.330 kg sitting directly on the glass shelf did not move under the same vibration. To test this theory out, I made a functional replica of the situation using a glass table, a piece of wood with some screws in for the hard uneven base, and a container of salt for the statue. Initial tests showed that the movement and rotation of the statue varied a lot based on the geometry of the base - i.e. the relative height of the screws. Adjusting one screw a fraction of a turn could entirely change the behavior. So it's pretty random that the statue ended up moving the way it did. As I did not have lots of people to walk around my table for days I accelerated the process by angling the table probably slightly more than the shelf (it's still only 2 degrees though), and by directly vibrating the table. This is obviously not the same as what happened - the magnitudes are different, but the concept is the same. Why has it never moved before? Firstly its obvious that that it's not been on that exact same shelf for "decades" or "80 years" as some news stories report. In fact that's the new Ancient World Gallery, which opened around Oct 2012), so it's been there for a few months at most. The curator simply said it had been on a similar shelf before. Secondly, experiments show the motion is dependent on circumstances. 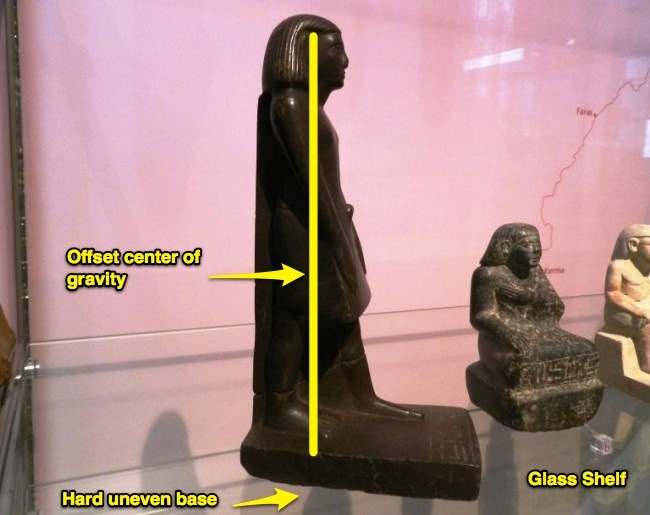 So something must have changed, but only very slightly - the slope of the shelf, the position of the statue on the shelf, even the position of other objects can affect the vibration. Even a very slight shift in the frame of the building could be responsible. And perhaps the previous curators had been sensible, and secured it to the shelf with a dot of wax. Why are the other statues not moving? Because they are different. They are smaller, they are shorter, they have a more centered center of gravity, they are made of different materials, they have different bases, they are in different positions. Why does it spin exactly 180 degrees? Because the shelf is sloped very slightly down towards the front of the cabinet, so it stops when the center of gravity gets to the lowest position. Why does it go round in a circle? Because it's pivoting on a point in the base. In my experiment this is represented by the center screw, which is just a tiny bit more protruding than the others. But the actual geometry will vary. Why does it rotate so slowly when yours goes so fast? Because of the magnitudes of things. The vibration is less in amplitude, the pivoting on the base is smaller, the slope is less. So it's doing to very large number of much smaller motions. B) Vibrations could come from people in other rooms, or upstairs. 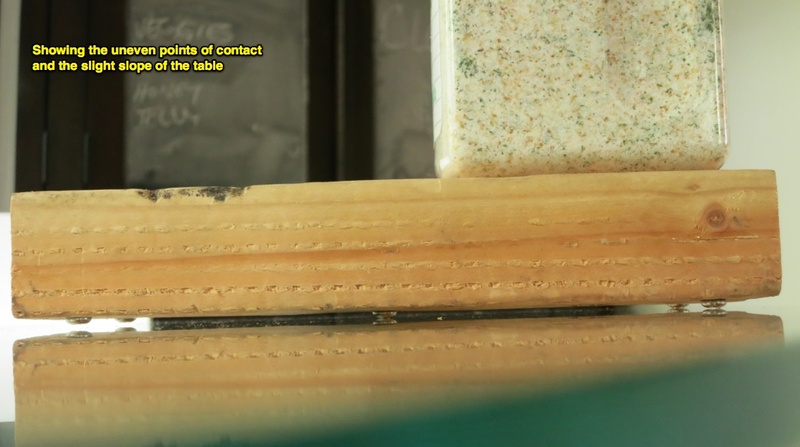 Another common problem in the display of ceramic and glass pieces involves the gradual, incremental movement of objects on surfaces due to underground vibrations. The movement can be caused by any constant, transmitted vibration source like subways, trains, underground equipment, and normal building vibration. 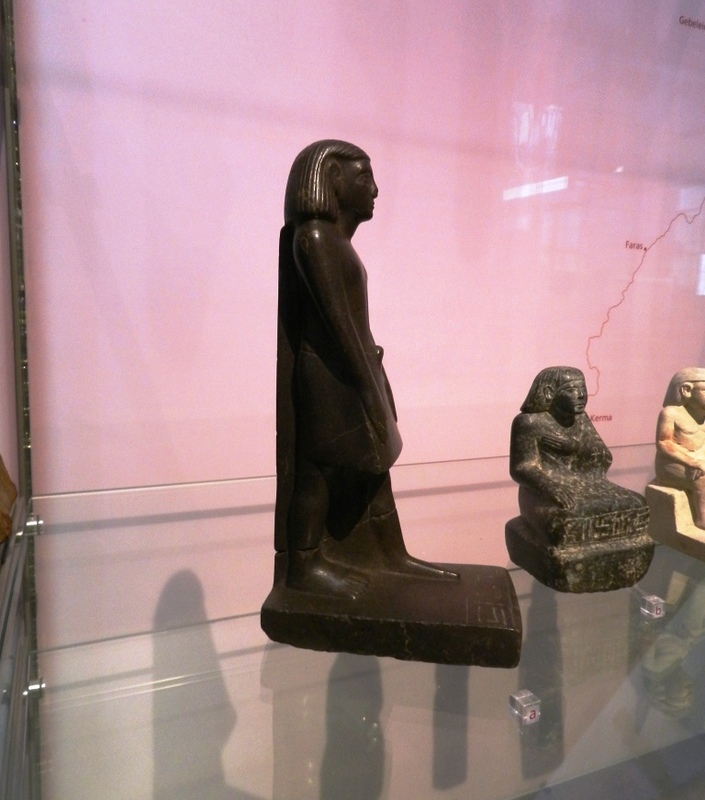 Objects in museums are often carefully secured to their display surfaces with very small dots of soft wax to prevent them from “walking” off their display vitrines. However free standing objects are proneto 'walking' at high levels of vibration which can lead to abrasion between adjacent objects. In several instances objects have moved a considerable distance, several centimetres. The microphone in this video seems to be doing the same thing. I look at the microphone and I notice it's turning. I think the explanation is much more simple. I read one article that said the "video" was a series of photos taken one minute apart. Notice the second counter doesn't move in the "video". They are moving the damn thing in between shots. I think that's a much more complicated explanation actually. Occam and all. Things walking on shelves is a known occurrence. Adding a bunch of people faking the movement in full view of museum guests, at a perfectly smooth rate, and nobody noticing, - that just introduces too many additional things. I know the museum quite well as the kids used to visit the vivarium. That section has wooden flooring throughout and it does feel springy in parts (trust be with 5 kids in a museum you learn to tred softly) Also it is on the Oxford Road side of the museum with the road been say 30 or 40ft away. Given the busy traffic, especially double deckers, one would expect even a minute amount of vibration. 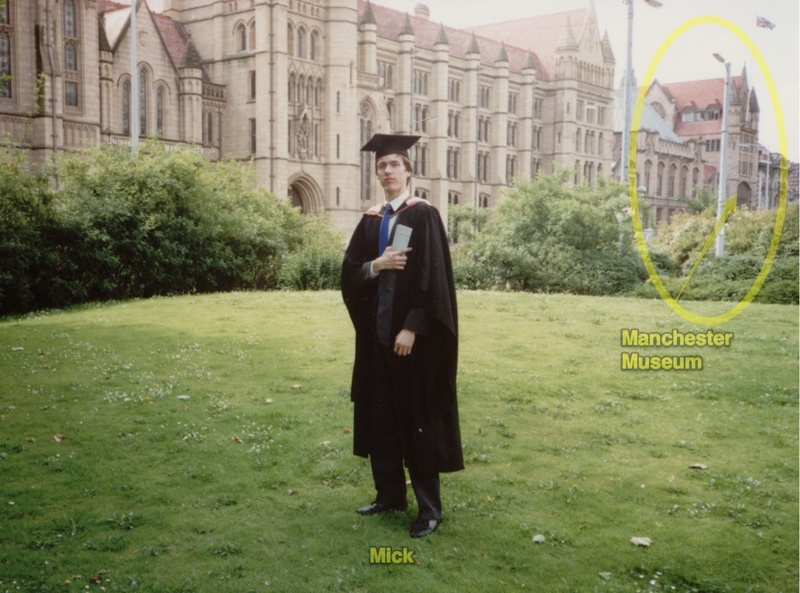 I graduate in the building next door, some years ago. I believe the curators and scientists mean well, trying to increase visitor figures and stoking interest in their subject, competing with today's entertainment culture. The problem is that what sticks in the end may contribute to the erosion of scientific thinking, becoming itself part of the entertainment cycle. I sincerely hope that Metabunk's "early debunking" can mitigate this process.
" This is obviously not the same as what happened - the magnitudes are different, but the concept is the same." Differences! Enough said. You are NOT convincing Sir. Especially given that nothing else ever moved a single, measly millimeter!!!!! I love all these DEBUNKING sites. You guys crack me up with your lack of horizon and scientific dogma you are suffering from. The other pieces on that shelf are obviously very different, especially regarding the center of gravity. So why should they not behave differently? It may also be that their base is more even, thus increasing friction. If you have a more reasonable explanation, I should like to hear it. Did you even read through Mick's analysis? I was skeptical both of the initial "magic movie statue", and was also skeptical that mere minor vibrations could move such a large, heavy object... however, as others have pointed out, this is a fairly regular phenomena that museums around the world have noticed, and usually take measures to counteract (such as the wax dot thing). It seems reasonable that some source of vibration, whether it be from visitors, staff, or aspects of the building such as air conditioning units, fans, etc... are in total enough to move an object on a near-frictionless plane with a low point of contact. The fact that it always stops in the same position also supports this theory. What doesn't seem like a reasonable explanation is the museum is haunted by ghosts. is about vibration, but not about people around. I saw something happening like that in a store. We realized that the vibration was coming from the street. The have traffic of trucks, buses and cars were doing enough vibration to make glasses moving after some hours. 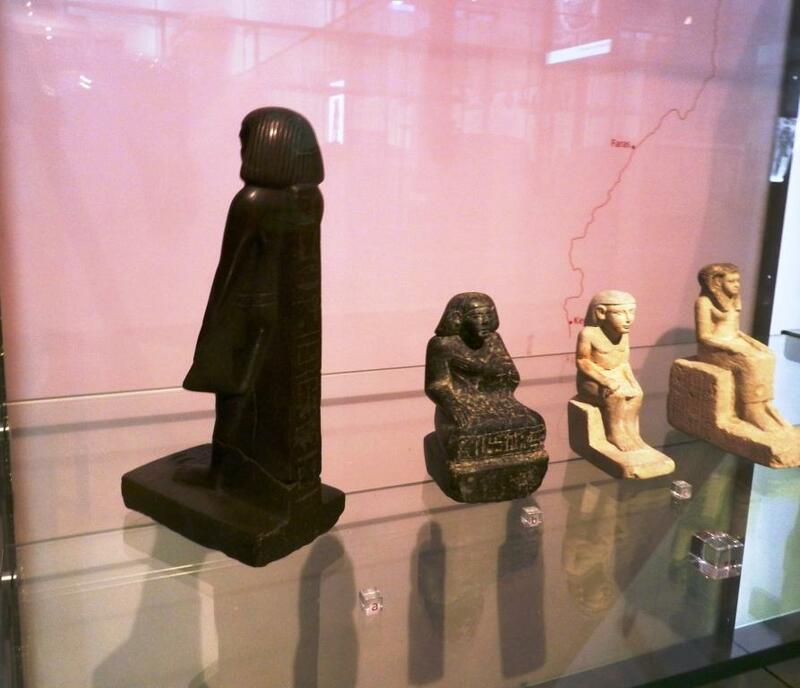 Curators at Manchester Museum were left baffled when a time lapse video caught the 10ins (25cm) high stone statue, which dates back to 1,800 BC, moving. Vibrations expert Steve Gosling placed a specialist three-axis sensor under Neb-Senu's glass cabinet to record its movement over 24 hours. He said the convex base of the figure made it "more susceptible" to rotate. The sensor revealed traffic and footfall vibrations at busy times of the day, such as 18:00 GMT and 07:00 GMT, caused the statue to rotate. Mr Gosling, of 24 Acoustics engineering noise consultancy, said: "The vibration is a combination of multiple sources so there's buses outside on the busy road, there's footfall activity." Honestly, as a former magician, I really really don't think it's as complicated as all that. The video has gaps. Someone probably just turning it every minute or so as the video stops and restarting the video. I know first hand that magicians and all manner of charlatans have no qualms doing the most devious and simple thing possible. Publicity. Occam's razor is that the most SIMPLE explanation is the most probable. No it isn't, Occam's razor says don't add new things when existing things already explain it. We know that vibration can move things. We know that there was vibration. Tests now confirm it. Case closed. I've seen this video. What you seem to be missing is the fact that the statue does not rotate during the day, only at night. I think you need to watch it again. I think you have that backwards. It's largely rotating when there are people in the room. This story was recently shown to me on facebook as proof of aliens/egypt/etc etc. Quick look up online unsurprisingly got me straight to metabunk (well done), and I hadn't seen this post already. 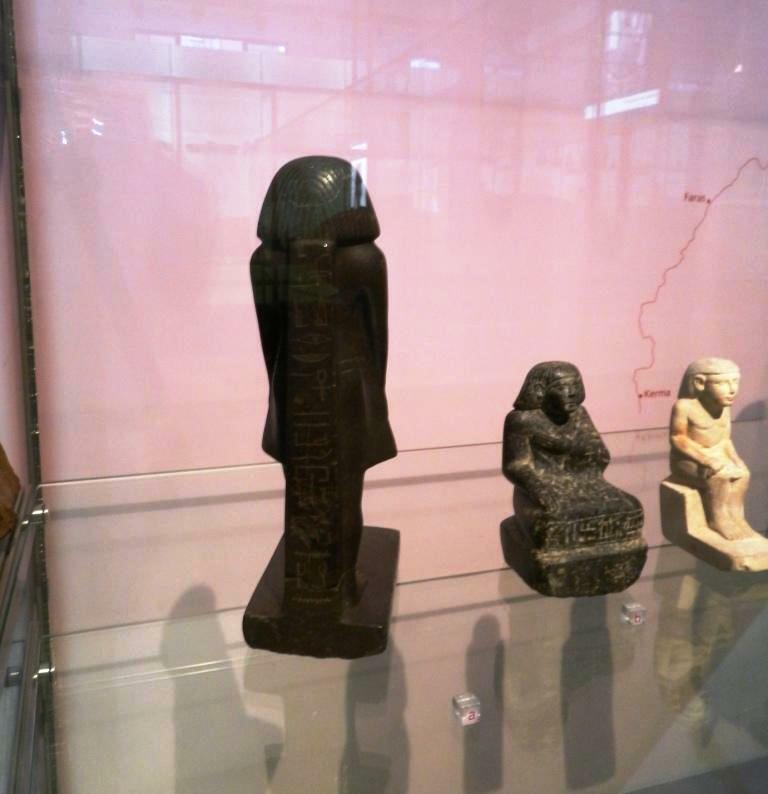 Anyways, I think I found a blog post from one of the curators of the museum about the statute from before the story went viral, and thought it would be a good addition to the thread as I can't see it mentioned already. He gives a detailed history of the statue itself and its ceremonial importance. He initially thought another curator was playing a joke on him, or moving the statue without notifying him, but he had the only key, but deduces that the rotation is being caused by vibrations, but seems perplexed as to why the perfect 180 degree rotation. Most Egyptologists are not superstitious people. 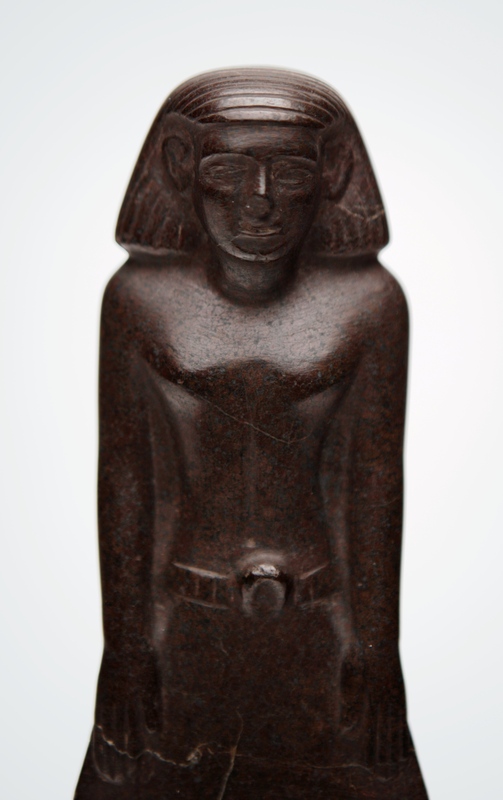 When I first noticed that one of our Middle Kingdom statuettes (Acc. no. 9325) had been turned around 180 degrees to face the back of its case in our new Ancient Worlds galleries, I wondered who had changed the object’s position this without telling me. The Egyptians themselves would have appreciated the concern to make visible for passers-by the text on its back pillar – a prayer for offerings for the deceased. Yet the next time I looked into the case, the statue was facing in another direction – and a day later had yet another orientation. None of the other objects in the display had moved. The case was locked. And I have the only key. The statuette had always intrigued me. It entered the Manchester collection in 1933, as part of a donation of five objects from Miss Annie Barlow of Bolton – three of which at one time were considered to be modern forgeries. The inscription on the back pillar reads: “An offering which the king gives to Osiris, Lord of Life, that he may give a voice offering, consisting of bread, beer, oxen and fowl for the Ka-spirit of’. As is known for other statues of this date and type, the man’s name – Nebsenu(?) – is inscribed on the front of the statue’s base. He bears what Alan Gardiner called as “obscure” title: Hry (n) tm. The distribution of the inscriptions suggests that the statuette was prefabricated with the standard offering formula on the back pillar and that the man’s name was added later to the base. Logical attempts to explain the statues movement centre on the subtle vibrations caused by outside traffic, causing imperceptible movement. Lill, a colleague on the visitor services staff, suggested that perhaps the man wanted us to say the prayer for him – yet when this text is visible his name is impossible to read. What is very strange is that the statue has spun in a perfect circle – it hasn’t wobbled off in any particular direction. The intriguing suggestion that the statuette was carved of steatite and then fired may imply that it it now vulnerable to magnetic forces. But is so, why did it not move on its glass shelf in pretty much the same position in the old Egyptian Afterlife gallery? I lied – others do have a key to the case, and it is just possible that someone is playing a trick. But I doubt it. The simplest solution seems to be to apply a tiny amount of museum wax to the base to stop the movement. But what if the statue continued to keep moving? What would our explanation be then..